Geneva (AFP) - Syria's warring sides clashed over the fate of President Bashar al-Assad, with the government vowing his ouster remains a "red line" for looming peace talks while the opposition vowed to see him go -- dead or alive. The UN-brokered, indirect negotiations due to begin in Geneva on Monday are the latest international push to find a solution to Syria's five-year civil war, which has killed more than 270,000 people. Government negotiators are expected in Geneva on Sunday, where delegates from the main opposition group, the High Negotiations Committee (HNC) are already preparing. But questions have been raised over whether the fresh talks will be more successful than the last round, which collapsed in February, as the two sides wrangled over the president's future. 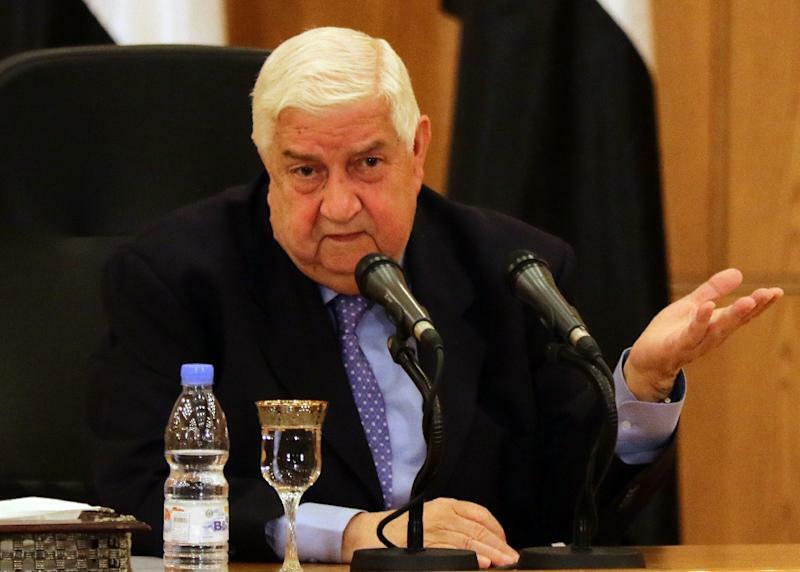 "We will not talk with anyone who wants to discuss the presidency... Bashar al-Assad is a red line," Syrian Foreign Minister Walid Muallem told a Damascus news conference. "If they continue with this approach, there's no reason for them to come to Geneva," he said. The HNC has repeatedly called for Assad's departure as a prerequisite for any deal, and chief opposition negotiator Mohammad Alloush said the president must go for peace talks to stand a chance. "We believe that the transitional period should start with the fall, or death, of Bashar al-Assad," he told AFP in a joint interview in Geneva. 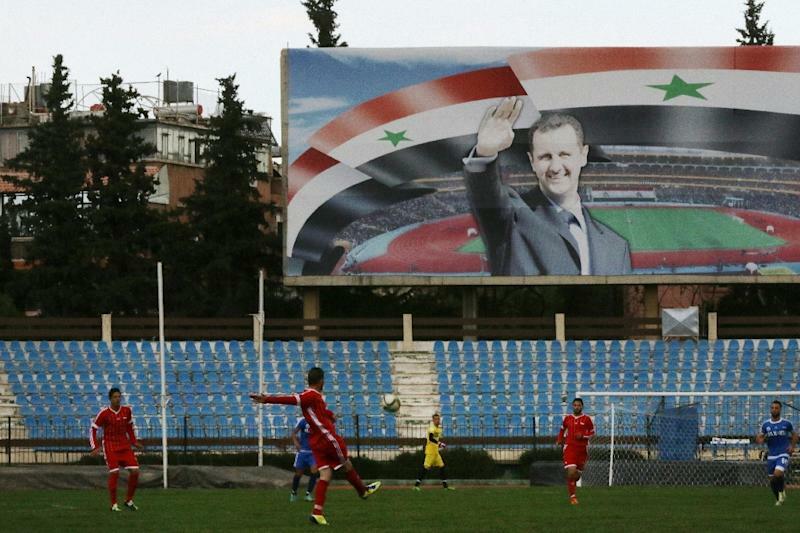 "It cannot start with the presence of the regime, or the head of this regime still in power." UN peace envoy Staffan de Mistura has said the Geneva meetings would not last more than 10 days. The negotiations are set to cover the formation of a new government, a fresh constitution and UN-monitored presidential and parliamentary elections within 18 months. Assad's fate has been one of the main stumbling blocks in previous rounds, with key ally Russia rejecting any suggestion he should go while opposition-backer the US has called for him to step down. Analysts have cast doubt on whether the latest efforts will be any more successful. "Assad is stronger than ever and is going nowhere," said Joshua Landis, director of the Center for Middle East Studies at the University of Oklahoma, adding the talks' agenda "is not realistic". Muallem said the UN envoy had no right to "discuss presidential elections," saying the talks aim to form a unity government to appoint a committee to either write a new constitution or amend the existing one. "Then we will have a referendum for the Syrian people to decide on it," he said. The HNC has called for the creation of a transitional body with full executive powers, and Alloush said Muallem's comments "show that the regime is not serious about the political process". There have also been questions about how far any deal would be felt on Syria's battlefields, where myriad groups have been competing for territory. Russia had called on De Mistura to include Syrian Kurds in peace talks, but the envoy told Swiss newspaper Le Temps that while they would not take part, they should be given a chance to express their views. 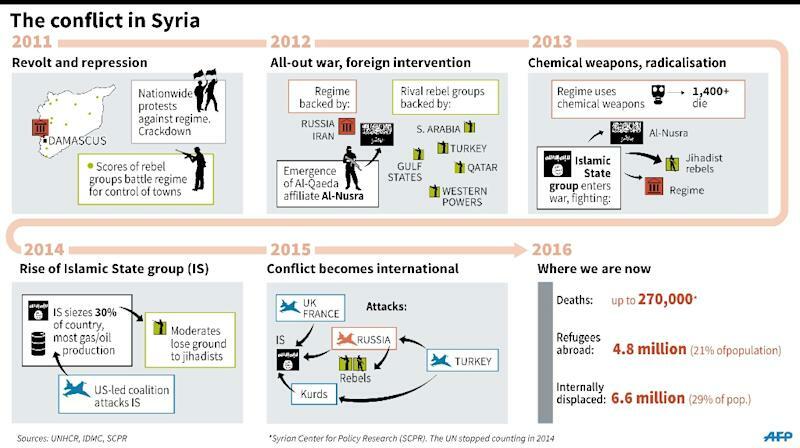 Fighting has eased across Syria since a landmark ceasefire between Syria's regime and rebels, bar some Islamist groups, took effect two weeks ago. US Secretary of State John Kerry said the truce had reduced violence by 80-90 percent since coming into force on February 27, which he described as "very, very significant" news ahead of the talks. He said US and Russian officials would meet in Geneva and Amman on Saturday to discuss opposition complaints of violations. "We believe that the start of talks this next week in Geneva presents a critical moment for bringing the political solution to the table that we've all been waiting for," he said after meeting top officials in Saudi Arabia. Both sides have accused the other of breaking the truce, and Alloush said there have been 350 violations since it began, which showed the regime was "not serious" about the ceasefire. Regime air raids killed seven civilians in rebel-held areas of second city Aleppo on Friday, the Syrian Observatory for Human Rights said. The Britain-based monitor said an Islamist rebel group claimed to have shot down a regime warplane Saturday in central Hama province, but a pro-government Facebook page blamed "technical difficulties". Elsewhere, at least three rockets fired from Syria hit the Turkish border town of Kilis without causing casualties, the local governor's office said.